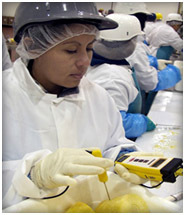 We care a lot about food safety, that is why we a specialized department focused on the safety of our products. Food safety is assured by monitoring the product from the plantation to the market with tools such as: quality system manuals, self-auditing programs, field inspectors, statistic data of productions and chemical use, and mock recalls. Additionally, we incessantly monitor the packaging operations through associated partners and carry out training programs designed for quality managers. Operations are also audited and certified against several food safety standards as requested by customers. We also hold a GlobalGap Certification, and our packing sites are built under the highest standards. Also, our production processes and packing systems are designed to provide detailed records and controls to ensure the highest quality and allow traceability for all of our products. BanaBay has developed a comprehensive program for food safety, from seed selection and crop inspection through to monitoring water purity and packing hygiene, before shipping any cargo. BanaBay is also applying several innovative programs of biological treatment on many of its plantations. Natural methods are used to fight pests and diseases wherever possible. Expert agronomists audit our fields to make sure they comply with strict environmental guidelines.